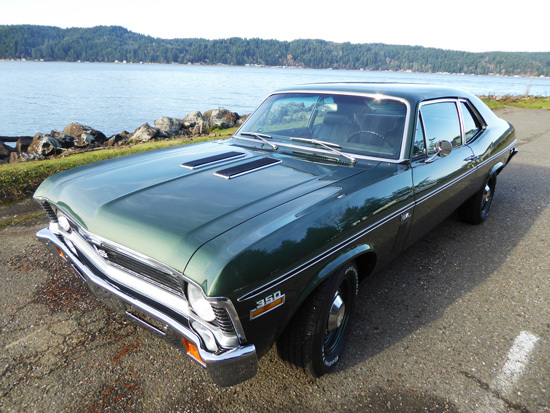 In January of 1970, I ordered my 1970 Nova SS (yes, it’s a one owner car!) from a Chevy dealer in Kent, WA. I ordered it (rather than buy it off the lot) in order to get it exactly the way I wanted it. When I received it in April, I traded the ’67 Nova in on it. The new Nova was our family car, driven daily up until about 1986 when it was last licensed. It made several trips back and forth between Burien (south of Seattle) and Pullman, on the far eastern side of the state, during the 4-1/2 years I attended Washington State University. In 1985 or ’86, I stopped driving the car and bought a more fuel-efficient car to commute back and forth from our home in Puyallup to my job with the Boeing Company in Seattle. The Nova, in need of some repair work, sat for close to 24 years, most of that time in a garage or at least under cover. In the summer of 2009, I decided to start restoration work on the car. I pulled the engine and transmission out in preparation for rebuilding. I removed the bumpers, the trailer hitch, most of the smaller items on the front end and under the hood, and the seats, door panels, and console. I had the bumpers, shifter and a few smaller parts re-chromed in Seattle and had the 350 engine totally rebuilt by Cope Brothers in Tacoma – they have been into racing and engine re-building for many years. In order to run my high compression 350 satisfactorily on today’s fuel, Cope Bros. bored the cylinders .030 over, put in a set of dished pistons to lower the compression, then replaced the original heads and intake manifold with new Edelbrock aluminum heads and intake manifold. When they ran the dyno on the engine, it registered right at 340 hp. A local Chevy dealer referred me to a reputable transmission guru in West Seattle by the name of Bill Ericson. Bill went through my Muncie 4-speed and totally rebuilt and updated it. Early the following summer, my resto work came to a halt when my wife and I suddenly, (and rather unexpectedly), bought another house in Belfair, WA, approximately 50 miles to the west of our then existing home. I spent the next 9 months working on our Puyallup home trying to get a number of big ticket items finished so we could sell it. In March of 2011, we listed and sold our home and made the move to Belfair, and a month later, I retired from my job at Boeing. 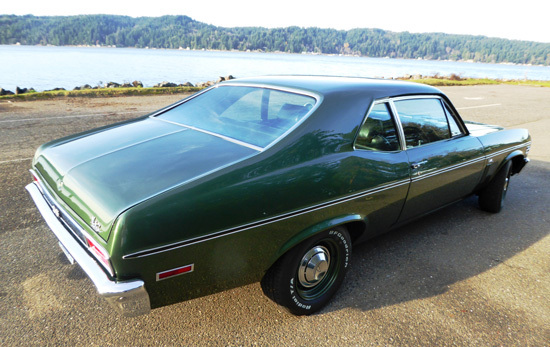 In February of 2012, after having settled into our new home for a few months, I handed the Nova over to a young paint and body guy in Silverdale, approximately 25 miles north of us. He’d been doing some nice restoration work on various makes and models of classic cars. Over the next few months, he totally tore the rest of the car apart, pulled the front sub-frame and the rear axle out from under it, cut out and repaired a number of small rust spots around the body and got everything primed. Unfortunately, from that point on, it seemed as though the car sat for weeks on end with very little, if any, significant work being done on it. It was a situation of too much work (7 or 8 cars) and too few workers (basically one guy) to do all the work. In the summer of 2014, after seeing no noticeable progress on the car, I was forced to find another paint and body guy, who turned out to be right here in Belfair. In August, he and I drove up to the Silverdale shop with his flatbed truck, retrieved my car and relocated it to the new shop location. Over the following 11-12 months, Troy Hack of Innovative Auto Body here in Belfair, did a wonderful job of completing the resto work on the car. 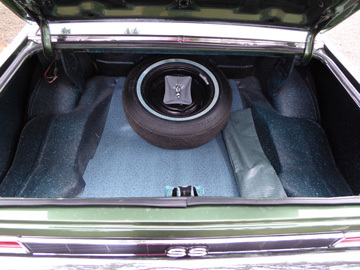 He and his guys removed all the undercoating, painted the body, restored the sub-frame and rear axle, and replaced nearly every part under the car with new, including the fuel tank and front and rear brake components. They reinstalled the engine, transmission, installed a new set of Stan’s Headers, replaced most of the parts in the engine compartment, reinstalled all the glass (including new windshield and rear window), refinished the dashboard and center console, installed all new “chrome” trim on the exterior and put everything back together, except for the interior. Just prior to the reinstallation of the rear axle, I took it to another well-known classic car restorer in our area, Gene Mehr, who did a superb job of disassembling and rebuilding the Posi rear end. 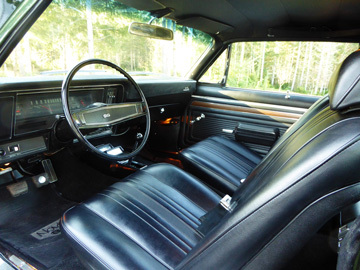 In August of this past year, after most of the mechanical reassembly had been completed, I took the car to Scott Whitlow of Shoreline Custom Canvas and Auto Upholstery in Port Orchard, a little north and east of Belfair, to have the interior work done. Scott did a beautiful job of re-upholstering the interior. 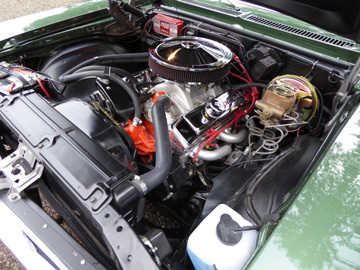 Having had many years of experience in the other facets of auto restorations and engine work, Scott also did a super job of replacing the Quick Fuel carburetor I’d had put on my newly-rebuilt engine (a big mistake on my part) with an Edelbrock 650 carb. He also got the engine all tuned up and running perfectly. My one-owner 1970 Nova SS is now finally road-ready and as fast and as beautiful as ever. Only difference is, it’s no longer my daily driver!